Hi girls! 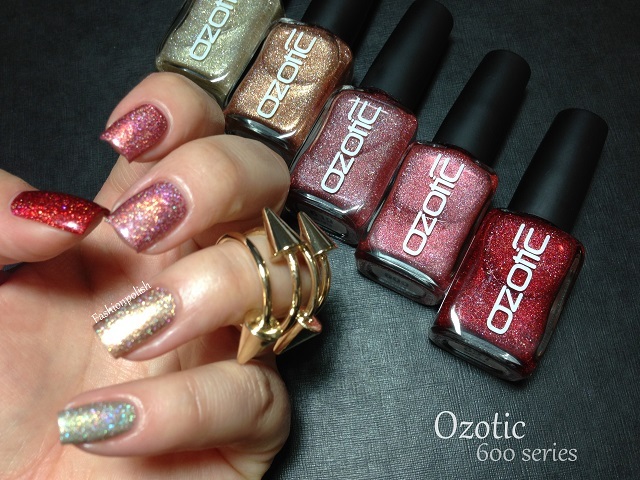 Today I have my second Ozotic 600 serie post to share with you! 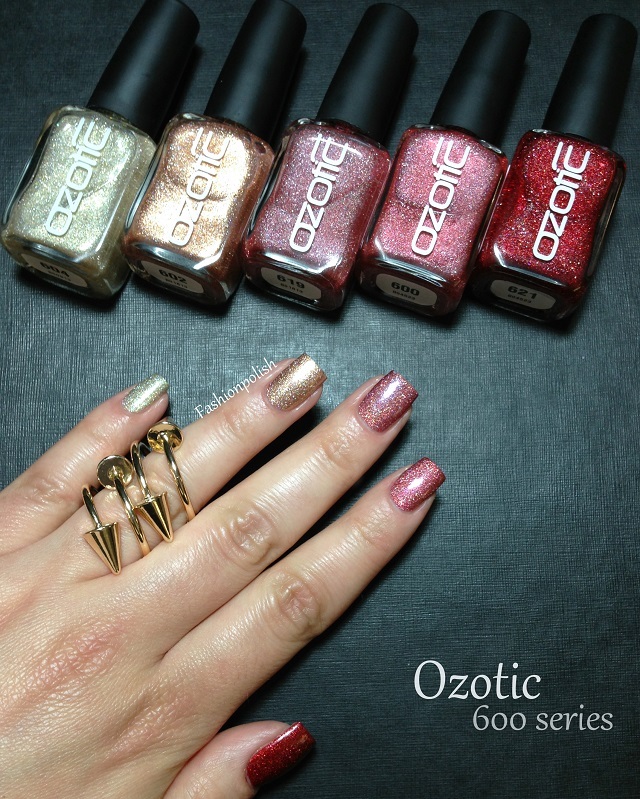 Ozotic 604 is a cool toned gold scattered holographic. I'm not that much into yellow based golds so this one is perfect for me with its pewter undertones. Formula was slightly sheer but applied like butter and required two coats for complete coverage. Depending on your nail length and application, I'd say it's a two to three coater. 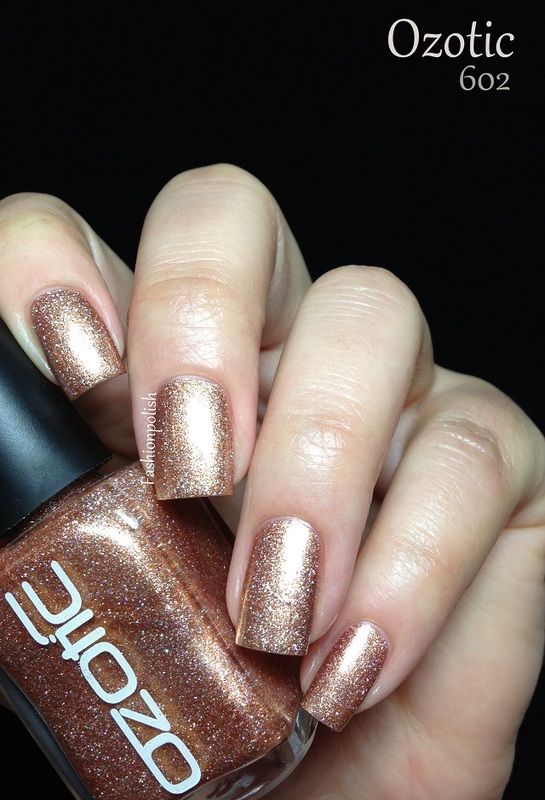 Ozotic 602 is a coppery gold shimmer with scattered holo particles. Strangely enough I really like this ones, so much for not loving gold haha. Formula was completely different than 604, literally packed with shimmer particles and much more pigmented, it could almost pass for a one coater. I used two coats plus topcoat. 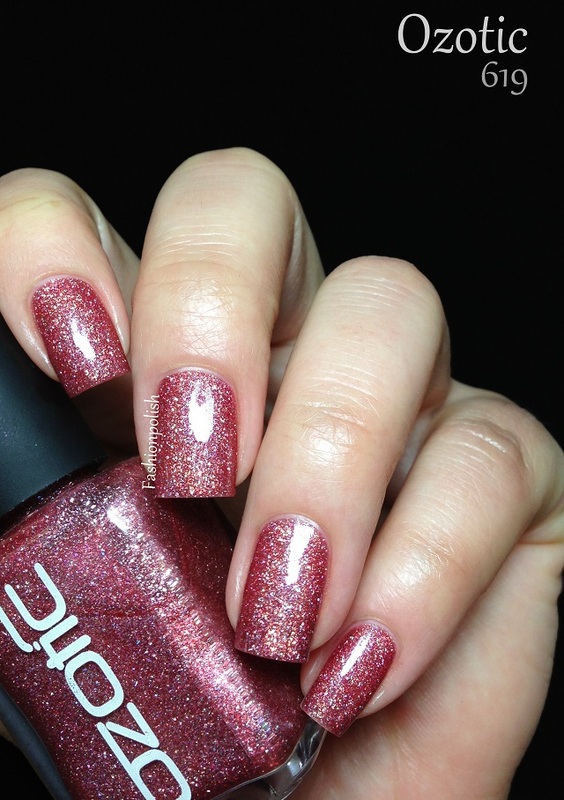 Ozotic 619 is a pinkish coral scattered holo with a slight brown hue, very complimenting on my skin tone. It's also the one with the strongest holo here, almost linear under certain lightings. More jelly-like and extremely even / easy to apply two to three coater, I used two coats in the swatches below. 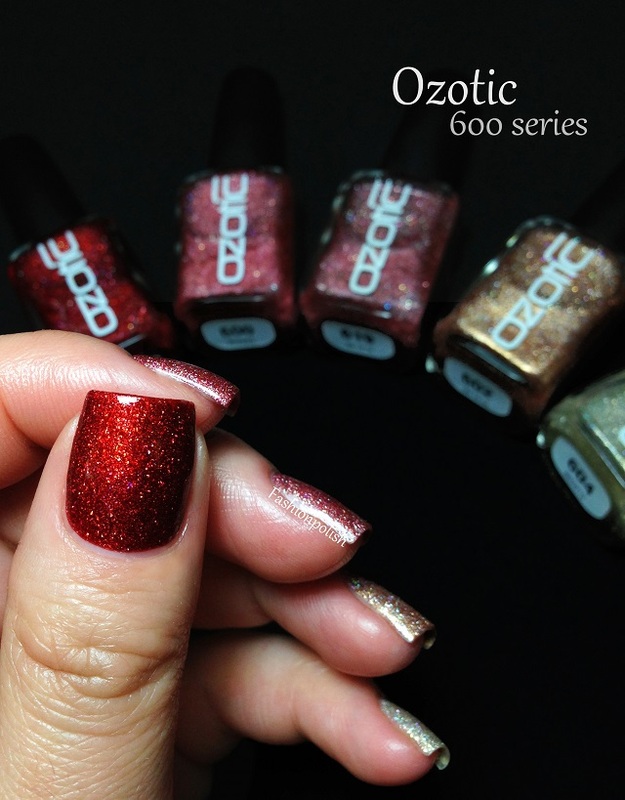 Ozotic 600 is a pinkish coral scattered holo with a faint red hue. Very similar to 619 in the bottle and on the nails, I'd recommend picking up the undertone that suits you best. Overall comparable to 619 in terms of formula as well, it did prove to be slightly more pigmented though and a true and easy two coater. 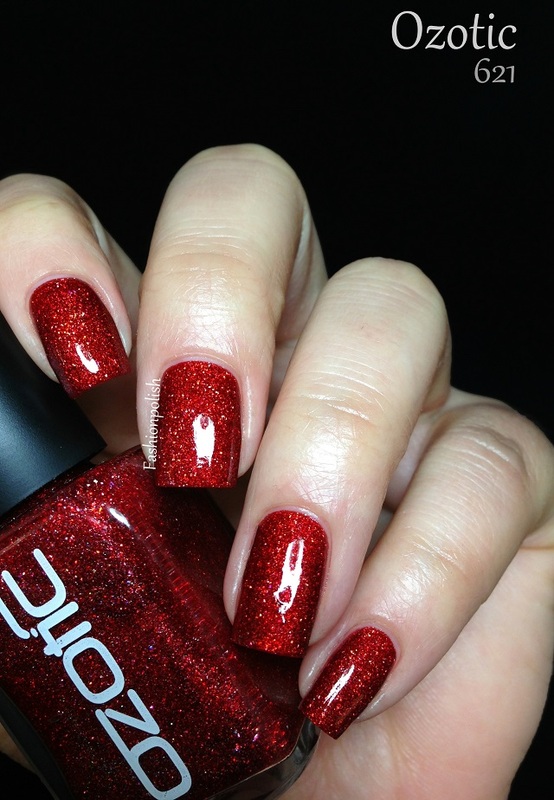 Ozotic 621 is highly saturated red scattered holo that screams WOW look at me!!! If I should keep just one red scattered holo ever it would be this one without hesitation. Intense, lustrous and extremely opaque, simply perfect. Formula was outstanding, offering a lot of control and completely opaque on the first coat, I used two below for an even more saturated look. And now more group photos!!! How do you fell about this second part of the Ozotic 600 series? Do you own any of them? Are you as crazy in love with 621 as I am? 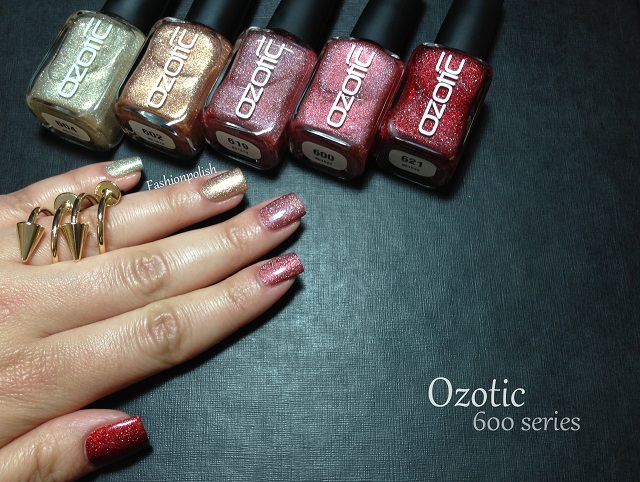 The Ozotic 600 series retail for AU$12 and can be purchased directly from piCture pOlish.com.au or through their international network. For more information, please refer to piCture pOlish.com.au, piCture pOlish on Twitter / Facebook and very soon on ozotic.com.au. 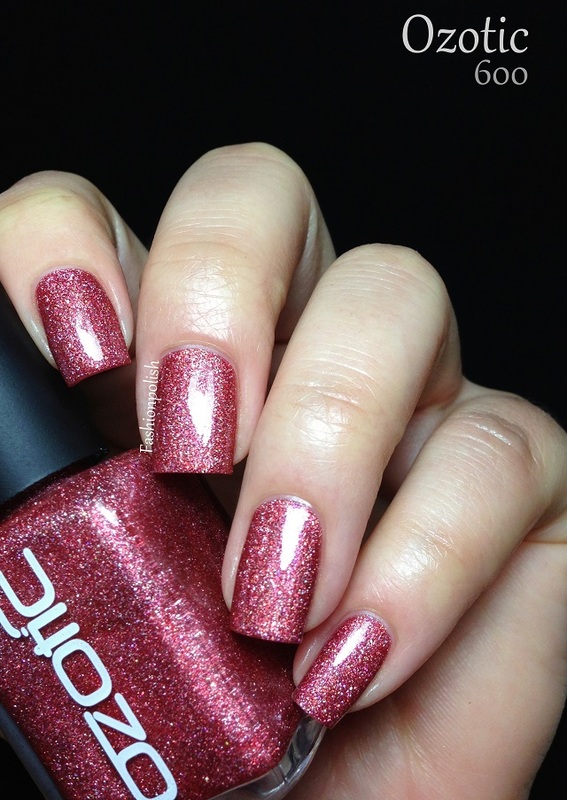 Yes, I have 621 and it's both one of my favourite reds AND one of my favourite holos! 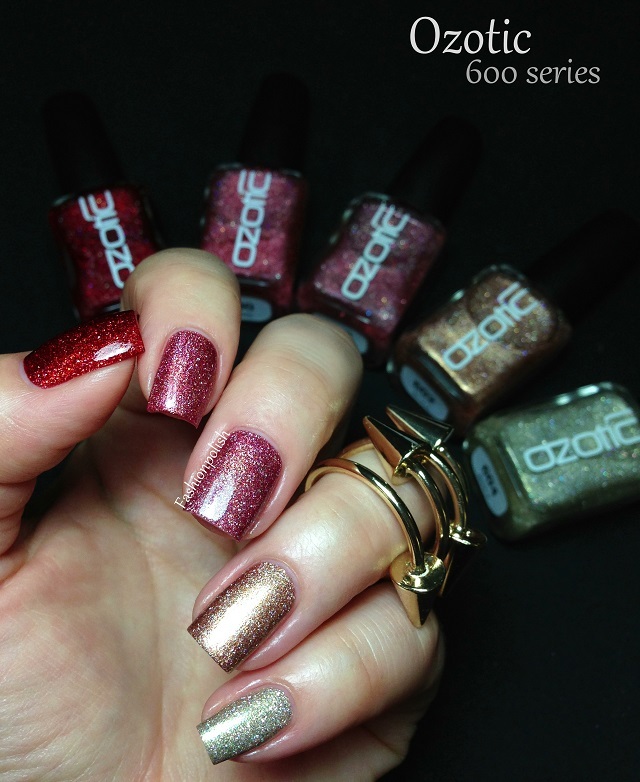 Also loving 604 in your swatches; I don't normally go for silver or gold but this is soooo tempting! Gorgeous pics. It's the 2d time you make me want a polish so much that i have to buy it. Magnificient 621 : can't wait to wear it. I *am* crazy in love with 621... How gorgeous! 619 and 621 are AMAZEBALLS. I need those immediately! OMG!!! 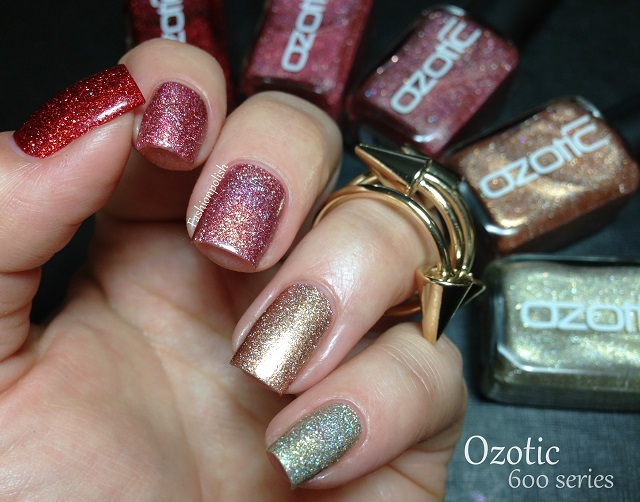 These nail colors are all so pretty especially the Ozotic 602. I find it more classy and elegant. I wanna have this and i just can't wait to try it out.